Well-known Windhoek estate agent, Gretha dos Santos, this week scooped the title Estate Agent of the Year for her performance in financing property deals through FNB Namibia. The best agency on the bank’s books is Just Properties while Roshwitha Haingura took the top spot both as agent and as agency among rural estate agents. 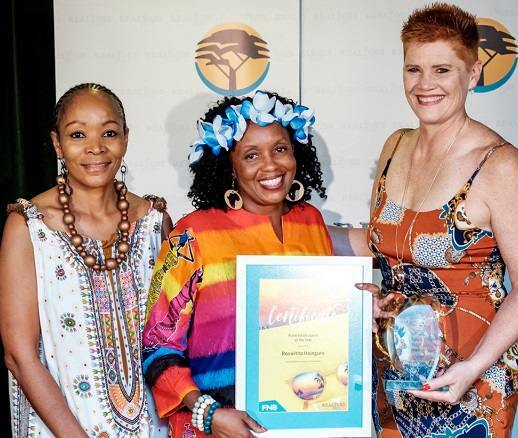 From the left, Rosy Jacobs, FNB Home Loans National Sales Manager, Roswitha Haingura of Haingura Real Estates, the Rural Estate Agent and Agency of the Year, and Magda Talbot, Head FNB Home Loans. Other estate agents with notable performances are Andreya Pereira, Anita Dames, Jan Visagie, Uripi Kauta, Willem Fourie and Lona van Wyk. FNB’s Head of Home Loans, Magda Talbot, acknowledged the very tight conditions in the market throughout 2018. “FNB home loans values you, our estate agents, developers and conveyancers and strives to deliver new platforms to improve our relationships. FNB Home Loans received business to the value of N$180 million from the top five agencies and the top ten agents totalled N$160 million. A total amount of N$570 million was received via the estate agent channel nationally and we are here to thank you for your ongoing support and celebrate the achievers,” she said. Praise also came from the bank’s top leader, Chief Executive Erwin Tjipuka, who said that 2019 is already proving to be a tough year for the property market with continuing price pressures and weaker disposable incomes. “We believe that property prices will continue decelerating during this year and will likely only normalise in 2020,” he said. 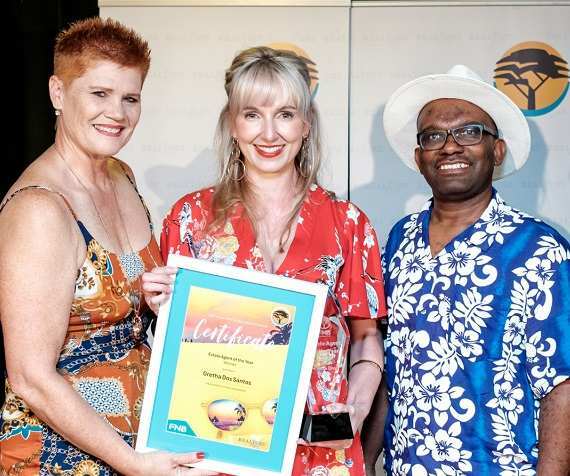 Main Caption: From the left, Magda Talbot, Head FNB Home Loans, Gretha dos Santos, the bank’s Estate Agent of the Year and FNB’s Chief Executive, Erwin Tjipuka.